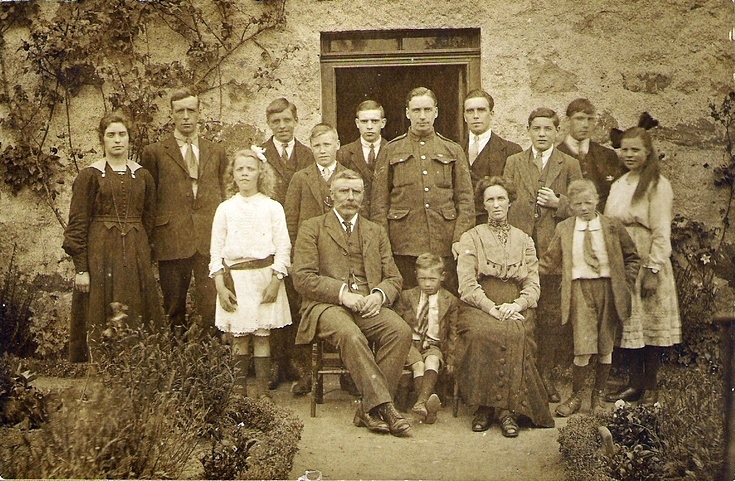 Diane McDonald-Brown says of this photograph: "This is William McDonald and Helen Buchan's 4th son, Raymond, with his wife Christina Clark and their children (NOT IN ORDER), Charles (grandad ,tall man on the left), Christine, Iain, Raymond, Andrew, Duncan, Robert, Alexander, Michael, Norman,Margaret,Jessica and James." It is believed that all of the boys went off to war over the years, and exceptionally perhaps, all returned safely! My Grandfather, Alexander (Sandy) McDonald, is the on the back row, third from the right (behind his Mother).